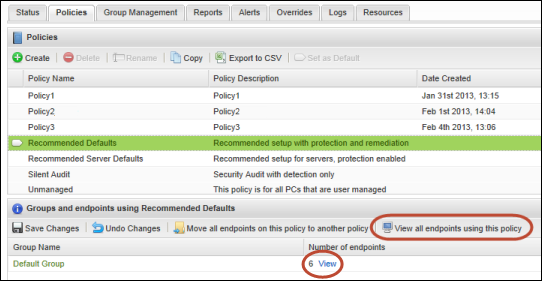 From the Policies tab, you can quickly view which endpoints are assigned to a policy. From the Policy Name column, select the desired policy. The bottom panel shows which groups use this policy. Click View all endpoints using this policy from the command bar. Select the View link in the row for the group. A dialog opens and shows the endpoint names and status. If desired, you can show or hide additional data about the endpoints. Click a column header to open the drop-down menu, then click in the checkboxes to select the columns to add or remove. For descriptions of the data in the columns, see Sorting data in tables and reports.